JLindley - Denver, CO, USA Aggressive and Effective "The DEI wraps have a faded appearance. Using the silicone spray does not only bring back the true color you wanted but also has help prolong the life of the wrap. I wrapped the headers and part of the exhaust on my Suzuki Marauder VZ 800. 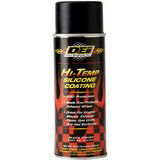 It has delivered not only the desired cosmetic affect but has also kept me from melting or burning my boots and legs." BigPoppaSalinas - Avondale, AZ. a must "If you are going to wrap your pipes this is a must. My pipes came out great."